EghtesadOnline: Leader of the Islamic Revolution Ayatollah Seyyed Ali Khamenei says Muslims should use the Hajj rituals this year to take a united stance against Israeli efforts to control the al-Aqsa Mosque. Tensions are still high at Islam's third holiest site in Jerusalem al-Quds where Israel deployed troops last week to restrict access to Palestinian worshipers but had to retreat amid fears that the standoff could turn to a large-scale revolt, PressTV reported. "The Zionists have become emboldened and rude, giving themselves the right to get tough with the owners of the al-Aqsa Mosque and prevent them," Ayatollah Khamenei told a group of officials in charge of annual Hajj in Tehran Sunday. "Where can the Islamic Ummah find a better venue than Hajj to comment on the al-Aqsa Mosque? Where is the place to take a position against the mischievous presence of America in the region? Hajj is the best venue," the Leader added. 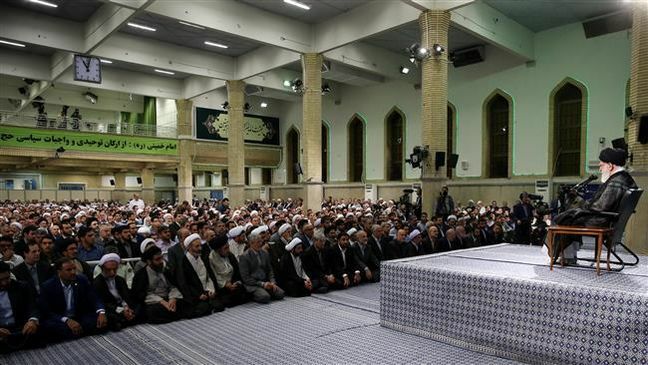 Ayatollah Khamenei also recommended that the pilgrims focus on the issue of unity, saying no one should do anything which may help create friction. The Leader further asked pilgrims to participate in congregational prayers in the Masjid al-Haram in Mecca which surrounds Islam's holiest site and the Masjid al-Nabawi which is the second holiest site to Muslims, situated in Medina.